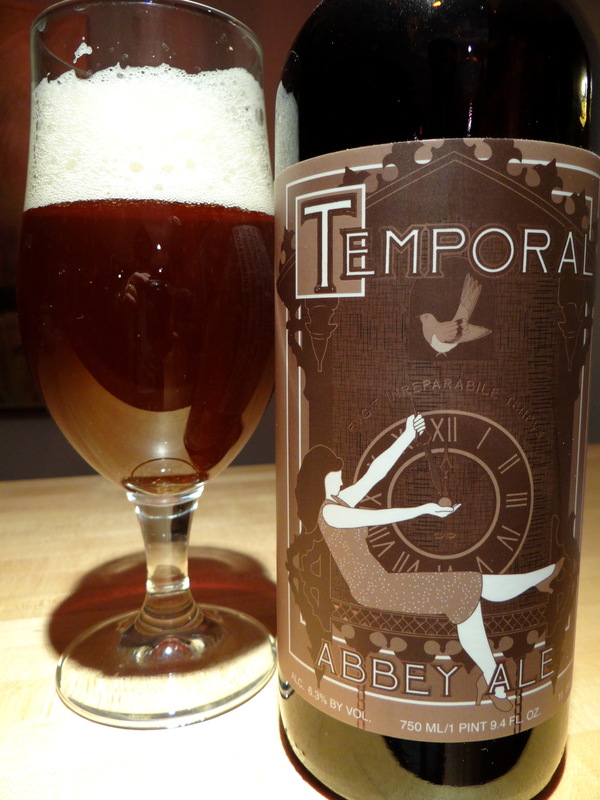 The latest offering from Actual Brewing Company is an abbey ale called Temporal. A bottle of Actual beer is almost worth the asking price just for the label artwork and this one is no exception (yes I do have a collection), a faceless woman is holding back the hands of a clock about to strike midnight, while a bird looks on from a position that evokes the image of a giant cuckoo clock. The style descriptor, Abbey Ale, implies a beer brewed in the tradition of the monastic breweries of Belgium and Holland. The most widely known styles of the Trappist breweries are the dubbel (abv = 6.0-7.6%), tripel (abv = 7.5-9.5%), and quadrupel (9.5-12%). Temporal with an abv of 6.3% is at the low end of this scale, bordering on the elusive “single” that the monks brew for drinking with their meals. To the best of my knowledge the only Trappist brewery that sells their single to the outside world is Spencer, the American Trappist monastery that only recently started brewing. So I’m curious to see what Actual has in mind here. This timeless abbey ale remembers a thousand years of Belgian brewing tradition. An infinite devotion to time and temperature connects brewers of the past and present. 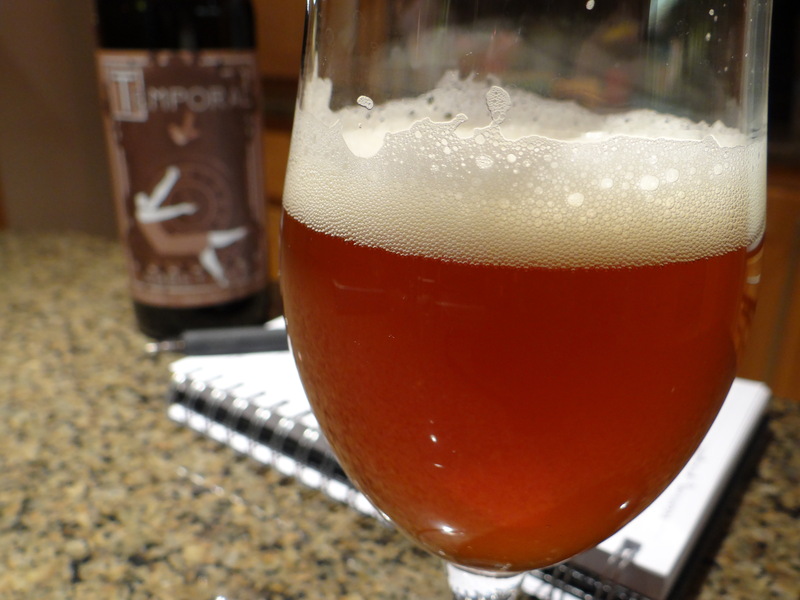 To the eye this beer is a translucent tawny colored liquid topped by three fingers of dense, creamy white head. The aroma is a mix of fruity, sweet, and spicy notes that is characteristic of Belgian golden ales. The fruity esters definitely lean toward the lighter end of the spectrum – golden raisins, apples, pears. The taste is less fruity than the aroma, while the black pepper spiciness is more prominent on the back of the tongue. I’m struck by how restrained the flavors are, more understated than I was expecting. The mouthfeel is light bodied and effervescent and the finish is unusually dry for the style. Temporal goes down easy without in your face flavors that challenge your palate. On the spectrum of Abbey Ales this is no dubbel, which implies the abbey single or pater’s (father’s) beer. If you are looking for a beer to accompany a meal without distracting you from the food, or something distinctly Belgian but moderately sessionable look no further (although I wouldn’t want to oversell the sessionable, because by the end of the 750 mL bottle I was feeling a little flush in the cheeks). Temporal matches my perception of what a “single” should taste like, a beer that quenches your thirst in a satisfying way without interfering with evening prayers.